Isn’t it strange how chance conversations can provide a new opportunity? 2 minutes spent chatting to my old friends from Basingstoke Astronomical Society at Astrofest saw me invited (gate-crashing?) 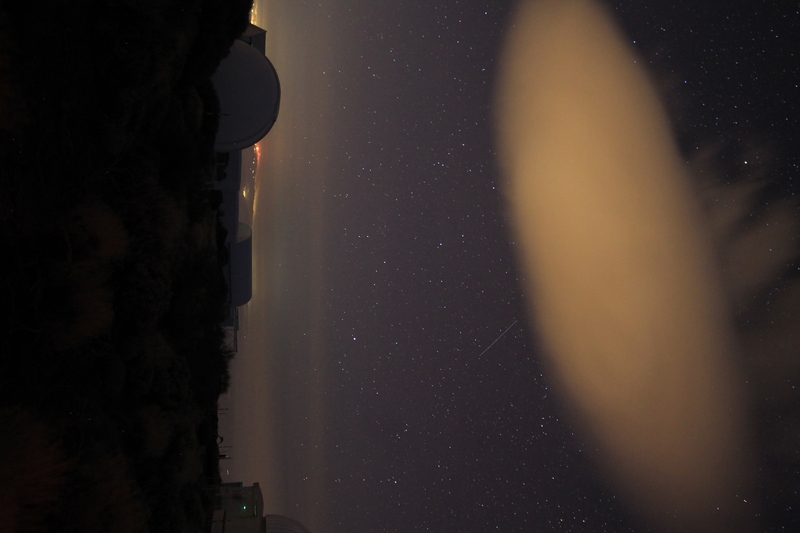 an observing trip to El Observatorio de Tenerife. 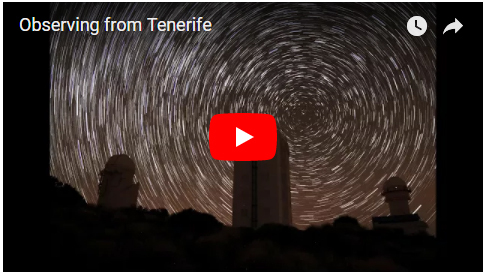 The skies over Tenerife are pretty dark. 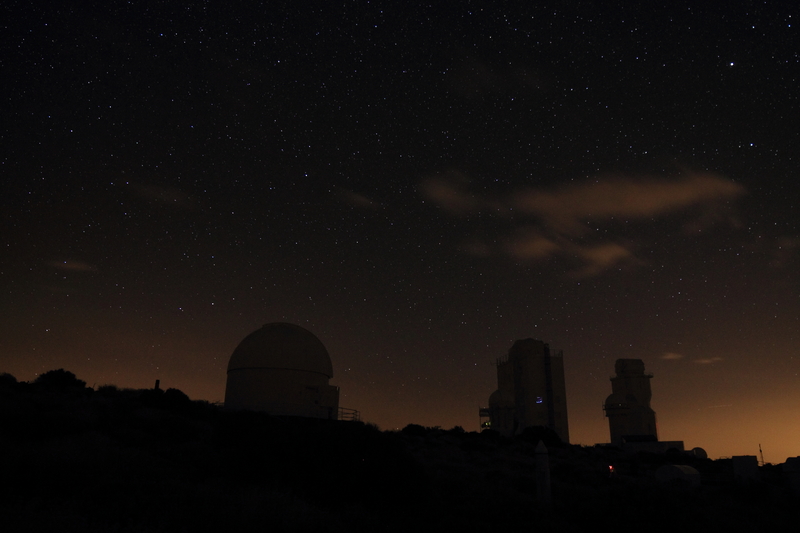 Dark enough for the Instituto de Astrofisica de Canarias (IAC) to build an impressive array of telescopes, albeit smaller than those on nearby La Palma. 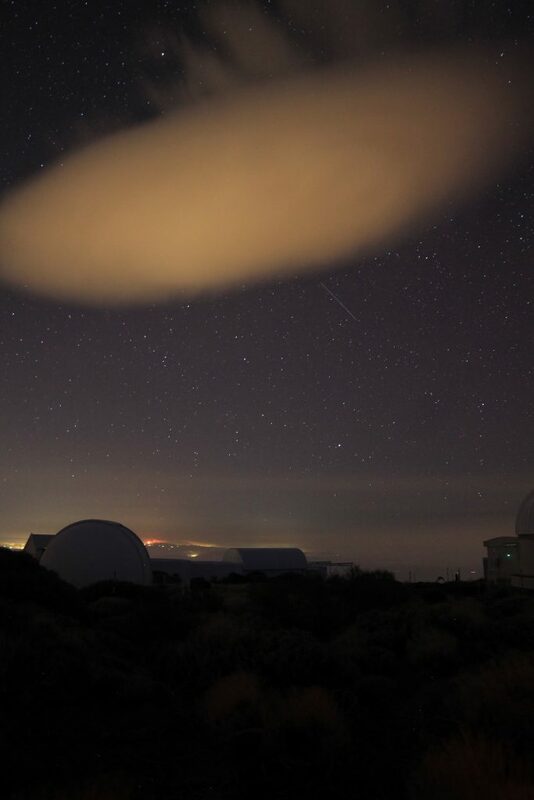 The other feature of the Canaries is that the facilities are on top of the mountain, well above the clouds and poor seeing. So good company, dark skies and a chance to get some sunshine and really immerse myself in the night sky. After the horrors of getting to Gatwick for an 0600 take off, we arrived under a milky white sky. The one risk of the Canary Islands, I found out, is that they are often covered in thick dust, blown across from the Saharan desert – known as the Calima. 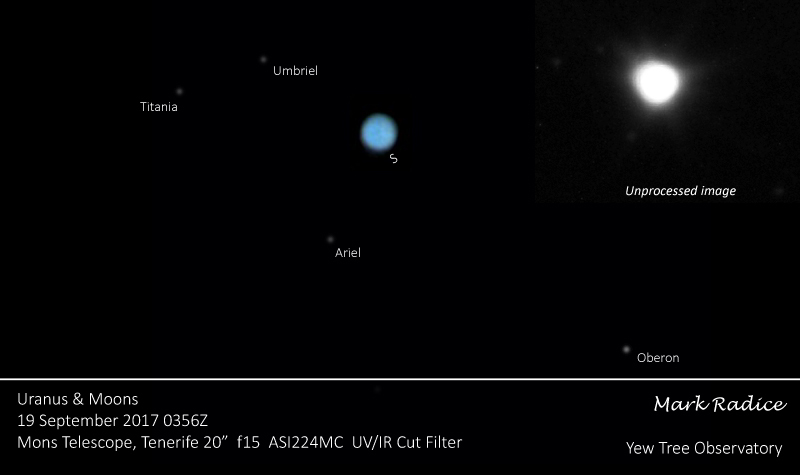 The dust really affected the skies for the first few nights. Observing overhead was fine so the dust was not too thick. The imagers in the group really suffered as it was enough to affect the quality of their photographs. Luckily one of the group, through contacts in the academic community had gained us time on a 20” f15 cassegrain. This telescope is made available to visiting students or in our case keen amateurs. 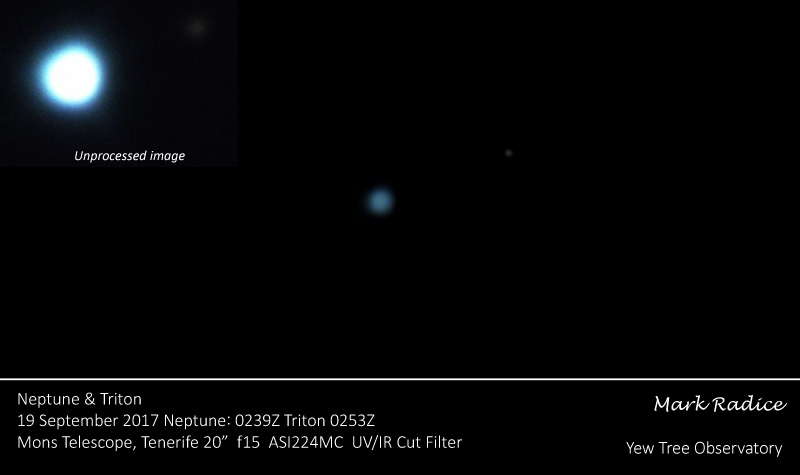 This would be wonderful for the planets although only Uranus and Neptune were near opposition. Mars was only just starting to reappear from behind the sun while Jupiter was setting at dusk with Saturn well past the meridian. Using the 20” telescope to peer into the outer solar system was a wonderful experience. These enigmatic objects are rarely studied as they are so small. 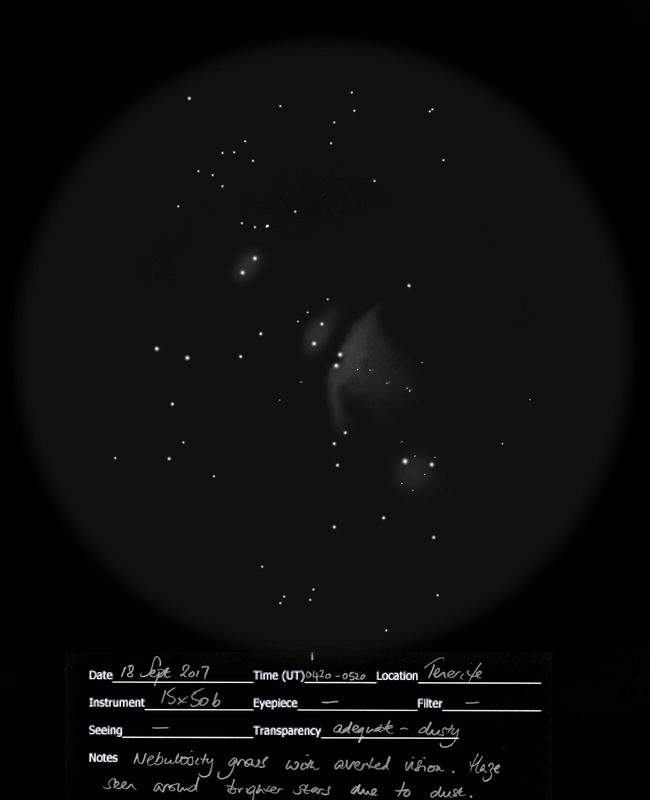 It was, of course, easy to pick up the surface discs and faint moons in such a big telescope (using both an eyepiece and the ASI224 high speed camera) but no surface markings were seen. I would love to return and do a dedicated run on Mars, Jupiter and Saturn when they’re near opposition. Not only did we use the telescope, we had access to a concrete pad (with power) to set up cameras etc and had use of a nearby office with loos, water, kettle, electricity etc. It certainly makes a change from SPOG nights in a field on Salisbury Plain! 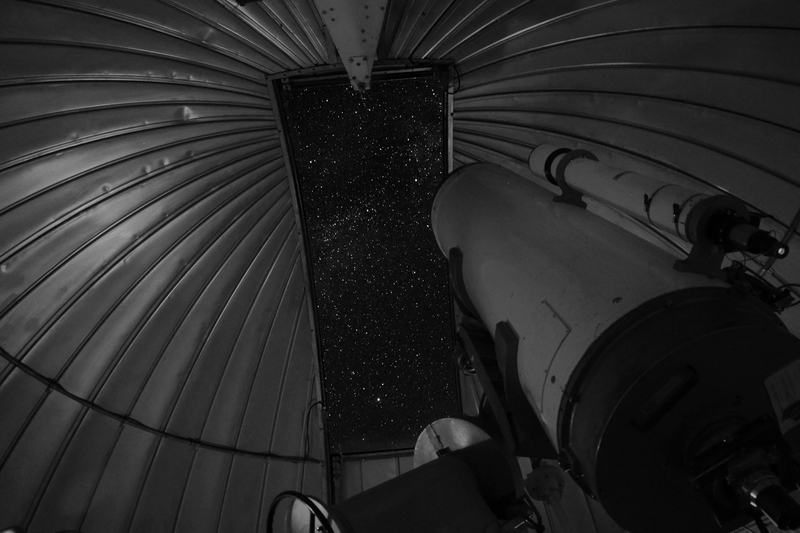 As we had access to the big telescope, I only took my binoculars and DSLR with wide angle lens. This was great as I could pop outside with the binos and relax in an office chair while the camera clicked away. Later in the week, the dust cleared to reveal a sky like you would not believe. 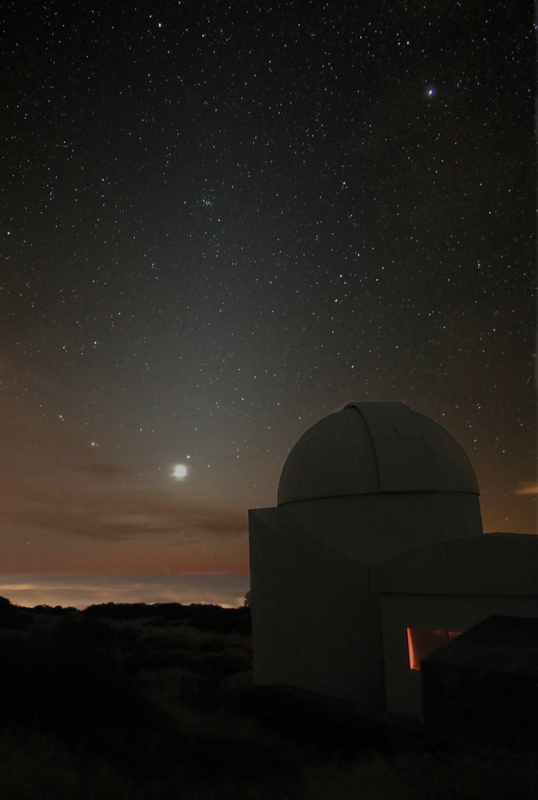 The skies were so dark that there was a wealth of objects to be seen. 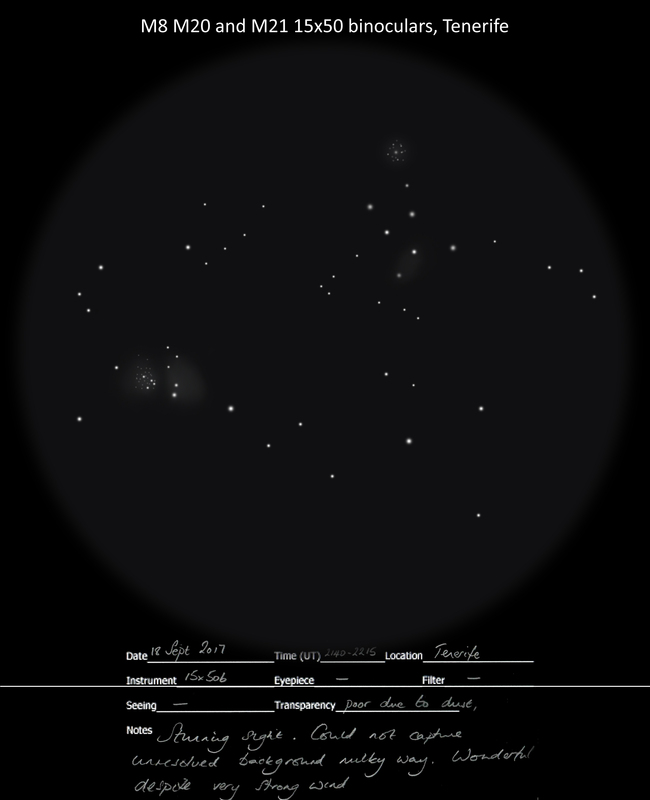 Messier objects such as M7, M8 and M11 were easy to see naked eye. Dust lanes in the milky way were an easy sight and using binoculars (as well as a borrowed 80mm ED refractor with 31mm Nagler) to scan our galaxy showed so much detail. The field of view was rich with innumerable stars while dark nebula were silhouetted against the fiery background like ink blots. I made some sketches through the binos. The False Comet is visible at the bottom of Scorpius. 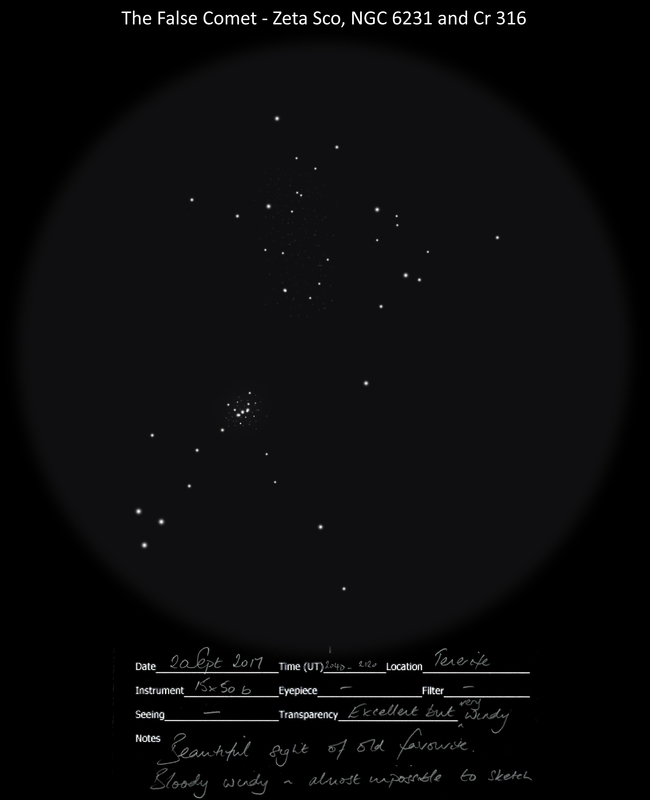 It’s a chance alignment of 3 relatively bright stars, a bright dense open cluster and a larger more diffuse open cluster which gives it this fan shape, rather like a comet. To the naked eye it does look like a small comet but this spell is broken through the binoculars. We can’t see this from the UK, it never rises so it’s always a pleasure to catch it on holiday. Further to the north is the large object, the Lagoon Nebula. Easily visible to the naked eye, through the binos you can see it’s a large nebulous region, cut in half by a dust lane, with a bright open cluster embedded inside. 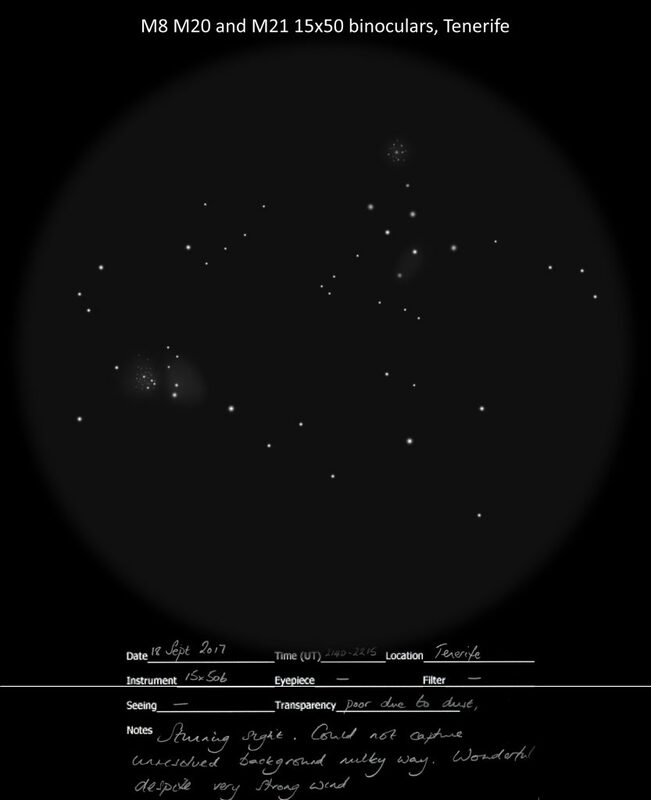 Nearby is M20 the Trifid Nebula and another open cluster M21 – that’s 3 objects in the same field of view. Later in the night, Orion rose with its famous nebula M42 and M43. Through the binoculars it’s a wonderful sight. You’ve got these bright stars of the sword of Orion with a bright nebula embedded inside. We’re actually seeing stars being born from a dust cloud. 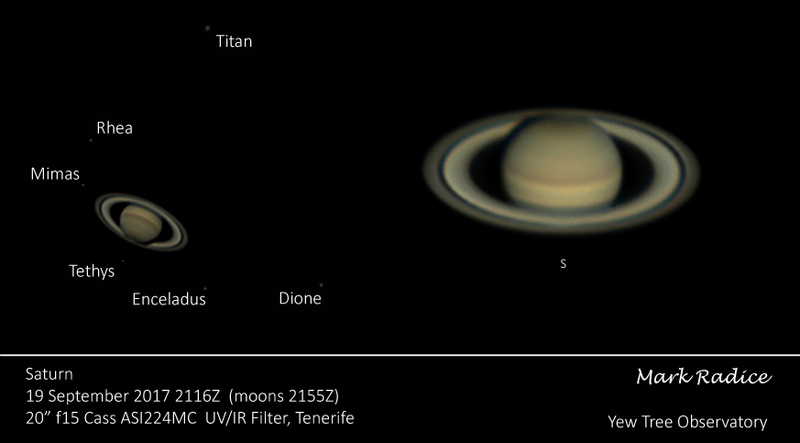 Observing from Tenerife really is quite special. One night a beautiful lenticular cloud set up over the mountain. I recorded a timelapse showing the cloud evolve over nearly 2 hours as the stars slowly move past it. I had to pinch myself as it was easy to forget that I was observing under a dark sky, surrounded by all these professional telescopes. 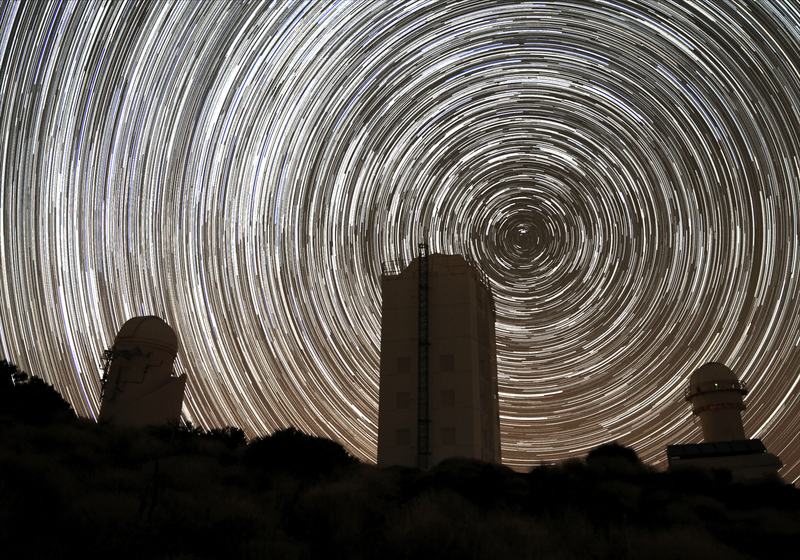 To the north were three solar telescopes that made a stunning foreground for star trails. To the west a telescope was tracking space debris. 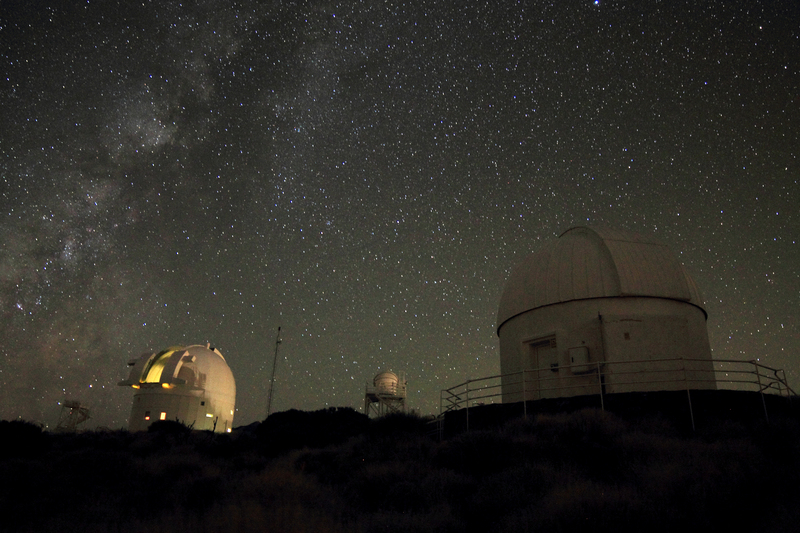 This made a wonderful sight as the summer milky way set – particularly as the telescope moved during the timelapse. Our own dome was silhouetted against the eastern sky. This provided a wonderful foreground as Orion rose along with the pre-dawn Zodiacal light brilliant Venus and the Beehive Cluster, M44. After a night of observing, we would drive down to our hotel before crashing out until the afternoon. 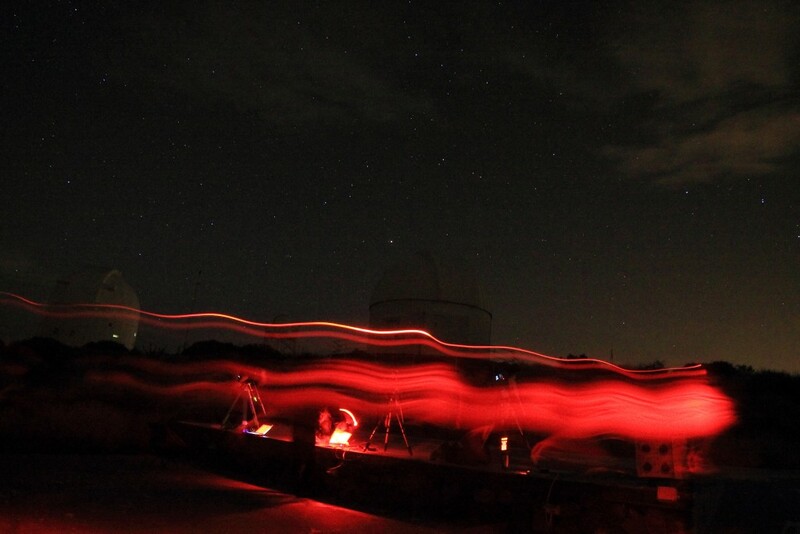 Then after dinner it was back up to the observatory. Eat sleep observe repeat. All too soon it was dawn and time to pack up. Them, after 6 nights of mind-numbing fatigued observing it was time to return home with a notebook full of observations and a hard drive full of photos ready to process.